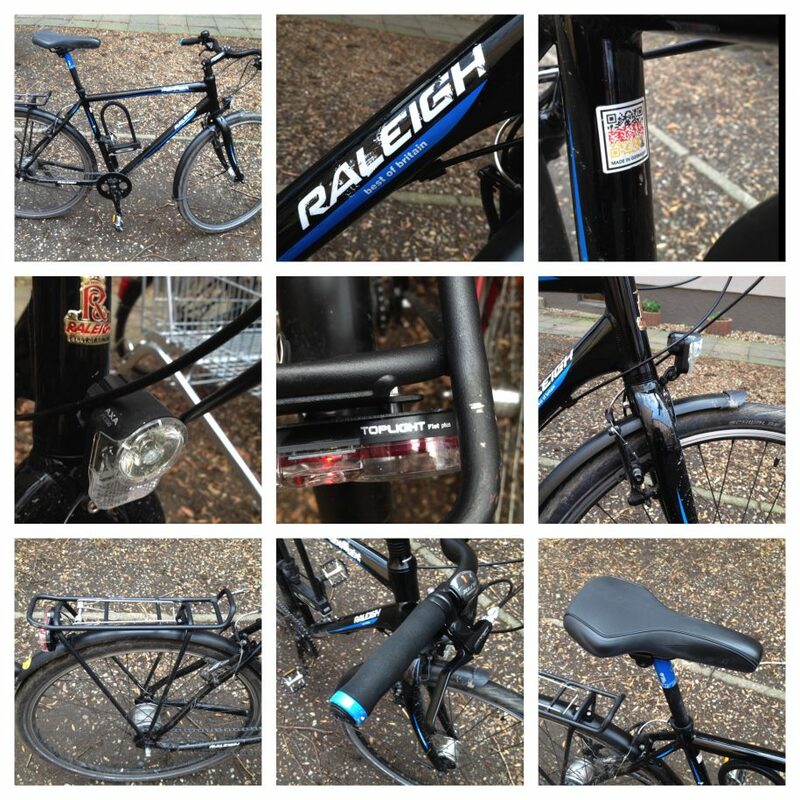 A year ago, immediately after moving to Berlin, I made one of the biggest single purchases I’ve ever made – a new bicycle, a Raleigh Nightflight 8G Men 2013, purchased from Radhaus Pankow for €649 (recommended price: €799). For 2014, Raleigh released a slightly updated Nightflight 2014, and I presume will do the same in 2015, but with so many features in common I think it is still worthwhile to write up my experience. It is worth noting that I bought this bike, rather than any other, not out of any sentimental reasons (my father grew up near Nottingham, the original home of Raleigh bikes – although this bike is actually made in Germany), but because it offered the best features for the price. I was looking for a fast city bike, without suspension forks, and with a hub dynamo, LED lights, mud guards, and pannier bag rack. This is the best bike I have ever owned, by some distance – admittedly compared to previous city bikes I have owned that cost half the price. It is always good to ride, and does everything you might ever require of a city bike, and is reassuring to know I can jump on it and it will be reliable and functional every time. I have had no serious problem with the bike, and use it at least every other day. Excellent. Shimano hub dynamos are always excellent and reliable, and this Shimano Sporthub dynamo is no exception. I would now never buy a city bike without a hub dynamo. The AXA Pico30 front light is small, but provides a strong and consistent light. The B&M Toplight Flat Plus back light does a solid job. Both front and back lights have a “standlicht” function, meaning the run for more than 5 minutes after you have stopped. The first time I’ve owned a bike with hub gears, and the Shimano Nexus 8-Speed hub does a super job. Gear change with the Alfine lever is smooth, light and reliable. The gear range would be wide enough even for a city with more hills than Berlin. Much better than a derailleur based system. The chain has no protection, and hence clogs up with muck from the streets, and trouser clips are recommended too. One reflector dropped off a pedal – these reflectors are held on only with rather flimsy plastic plugs. Standard Shimano M 422 V-Brakes on the rims, but when adjusted correctly these do a reliable job. Mounting the brake behind the fork on the front is a neat design solution. The supplied Schwalbe Spicer tires are of course un-puncturable, and the relatively little tread helps with the speed of the bike. However in the autumn, when Berlin bike paths are covered in leaves, the tyres slip rather easily – something with a little more tread would be better for the city. Wheels and rims are strong and rigid. I’d wondered about the durability of the foam like handlebar grips when I purchased the bike, yet 1 year on they are holding admirably and are comfortable. The geometry of the frame and handlebars is good for a relatively streamlined cycling position – this is not a bike for leisurely pottering around the city, but to get from A to B quickly. One of the cleverest and neatest aspects of the bike – the rack is narrow and slim, and lacks all the extra pieces that add weight to some racks. It is strong and stable too, easily carrying panniers full of shopping. The bike, as city bikes go, looks sleek and reasonably elegant. It has all the features you need in the city, and no extras. Cheers for the advice with the Ortlieb bag, looks nice and spacious. I will definitely check it out once I find a local dealer who has some choice here in Munich. @Steve – that 2015 model looks good! How’s the belt-drive? As for a bag – I have a standard Ortlieb Office Bag, using the regular mounts (not Orlieb’s special QL3 mounts) to put it on the rack. I’ve actually owned the Ortlieb bag longer than I’ve owned the Raleigh bike and after more than 4 years of use it’s still going strong, and it is still waterproof. Hey Jon, nice review of the bike. I got myself a 2015 Nightflight and am very happy with it (except for the snow in Munich, but that’s another story). I was wondering if you could give me any advice regarding bags for the rack – are you using any?